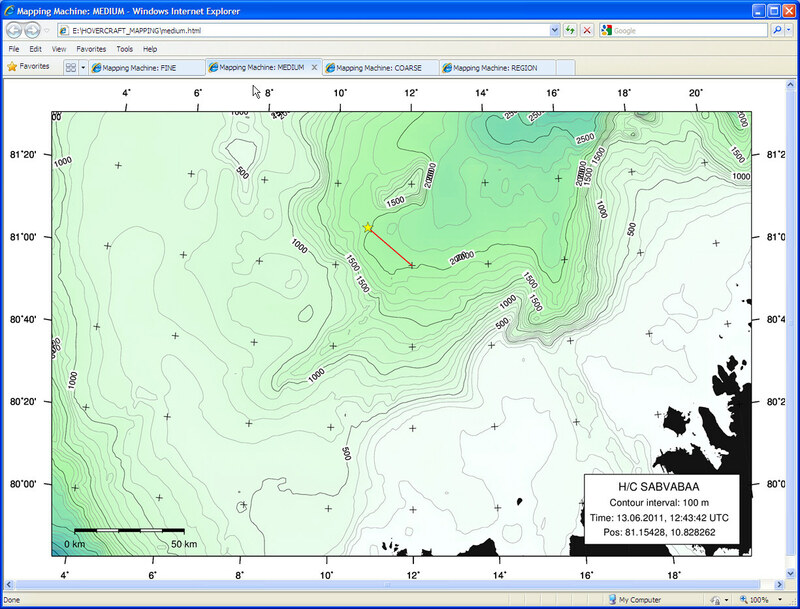 The Map Machine reads GPS data from vessel network and uses Generic Mapping Tools (GMT) and the IBCAO bathy data set to produce maps in four resolutions at regular intervals. 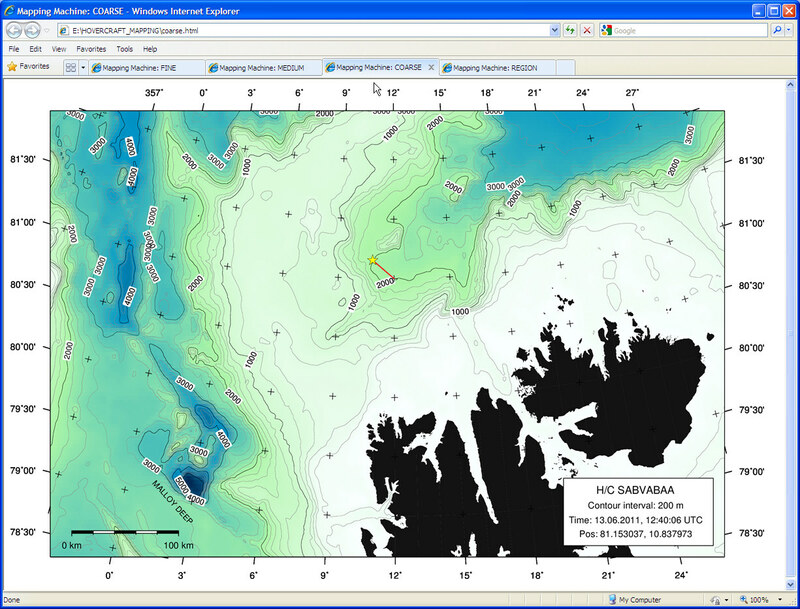 User interface is through web page where the four maps are available in separate tabs. Screenshot below shows map with highest resolution. See also medium, coarse and regional resolutions. 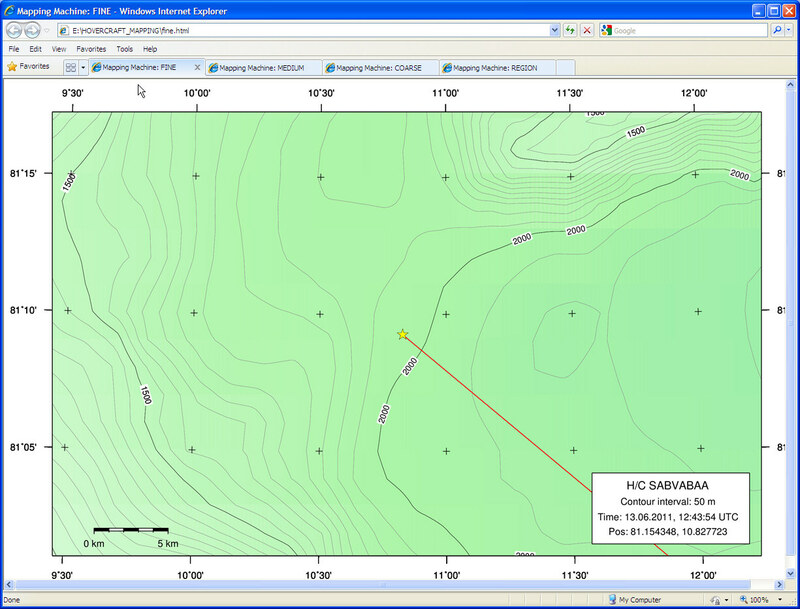 The maps track vessel position. In addtion, the map machine program saves trackdata to file every 30 seconds. Both GMT and ImageMagick should modify the PATH environmental variable to include link to their executables. 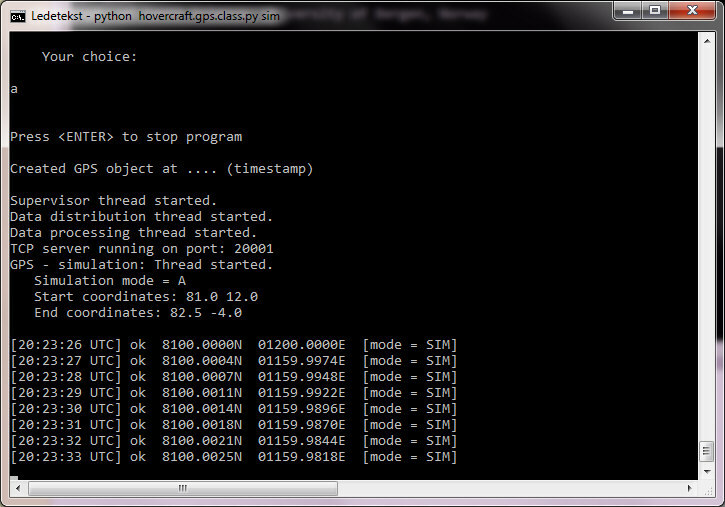 Verify by opening terminal window and issuing first pscoast and then convert command. Both commands should produce a lengthy help usage section. These programs are not needed to run the mapping program, but are helpful in testing and development. We can recommend Programmer's Notepad for script editing. different programs that all share a need for time- and navigation input. Map machine software structure (diagram Excel file). 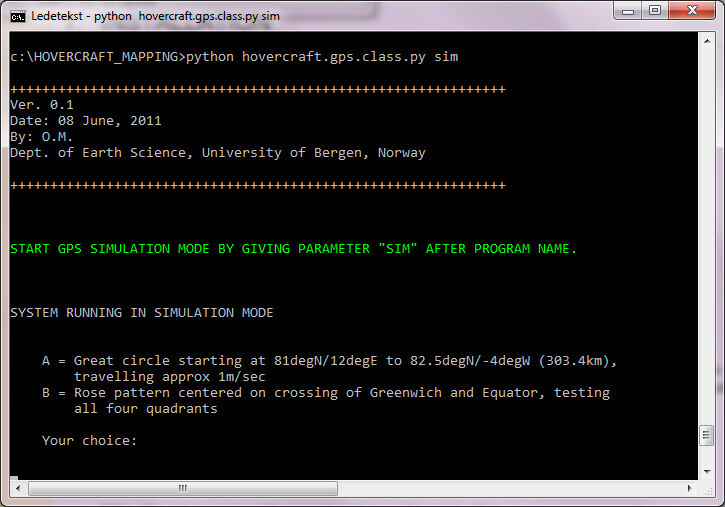 Test first mapping software by starting a GPS simulator. The program will first create four maps from the ground up - a time consuming process; approx 1 minute per map. 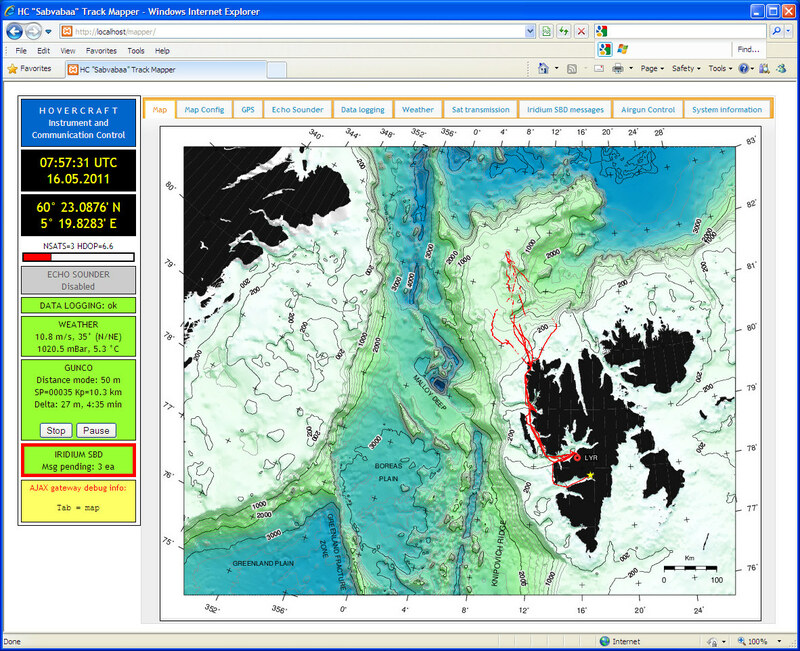 When the program redraws map later on, it operates on the top layer of the map, only updating current position and trackline (maps are produced in PostScript, building layer upon layer, and converted to JPG in the end). After a while, the mapping software enters normal mode. The interval between map regeneration is determined by settings in INI-file. There are two types of map regeneration: a) Only current position and trackline, and b) complete map. The interval between partial redraw is set in INI file. The interval between complete redraw is guided by the need to keep vessel in map center (more or less); the redraw threshold (in km) is set in INI file, and the vessel speed will of course determine how fast this threshold is reached. Next, open IE web browser. Startpage is set to show the four maps in separate tabs. Map with FINE resolution has shortest update interval (ref INI file). 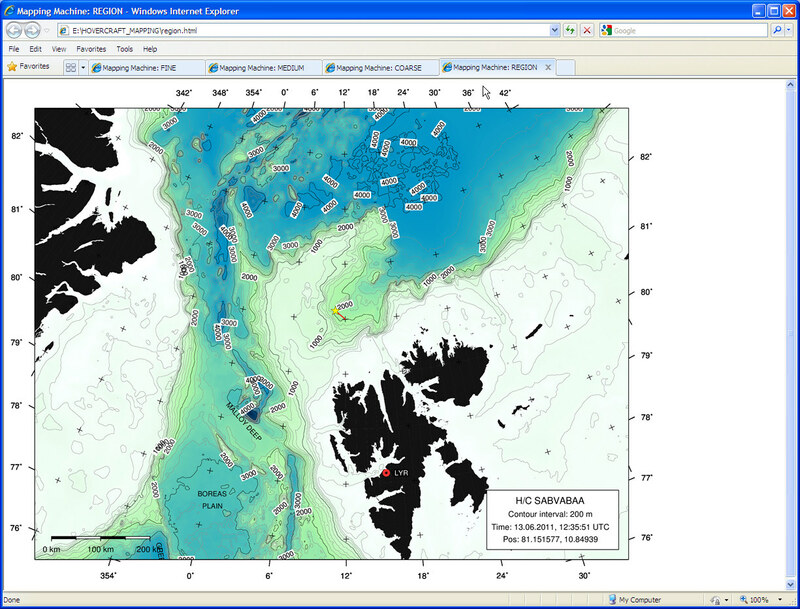 Screenshot below shows the first version of a combined map machine and instrument integration application, using a standard browser as user interface.